We decided to walk all the way up the Las Vegas strip -- mostly. The plan was to start at the South at Mandalay Bay, then walk North up to the mall. However, the place we parked turned out to have a direct entrance to the Luxor. 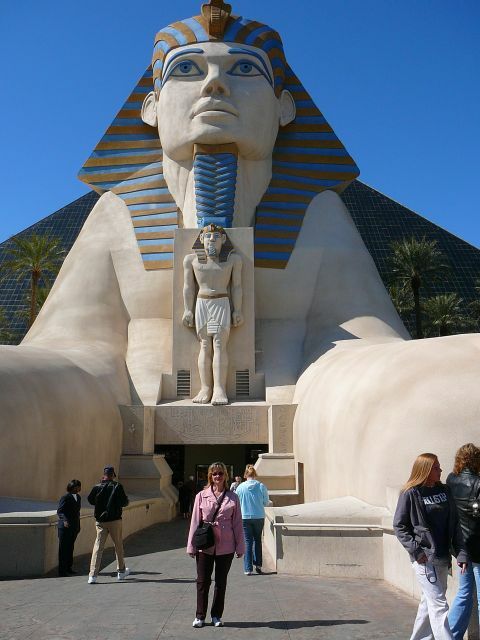 Here's Mary at the Sphinx entrance to the Luxor. You can see (somewhat) the pyramid behind the Sphinx. Actually, we weren't going in. We were trying to find a way out! We came out this way because we saw daylight. The Sphinx only goes to a short-run monorail. You can't get down to the street. After a few minutes there, we found there actually was a way to get down to the street. Casinos (in general) are designed to trap you. The way in is obvious, but the way out isn't. In many of the casinos, the way in funnels you to the gaming area. Turn around and look at how you came in (if you remember to do that! ), and what you see looks like a dead end.